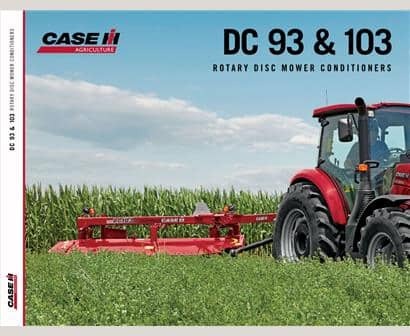 The DC3 series disc mower conditioners provide industry leading cut and crimp for superior hay quality and optimal windrow formation. Model Year 2019 updates to these rugged and efficient tools include a new, quick-change knife system, new header tilt cylinder and a new heavy-duty curtain. A modular cutterbar design with superior crop flow, resulting in less streaking and a 9' 2" (2.8 m) cutterbar width and seven discs. 9’2” of cutting width available with either the drawbar swivel hitch or two-point swivel hitch to get maximum turning performance with zero driveline wrap-up. 10’4” of cutting width glide through lush stands of alfalfa, acres of dense grass and even tough cane crops, at high ground speeds. Providing industry-leading cut and crimp for superior hay quality and optimal windrow formation with a 13' (4 m) cutterbar width and eight discs. 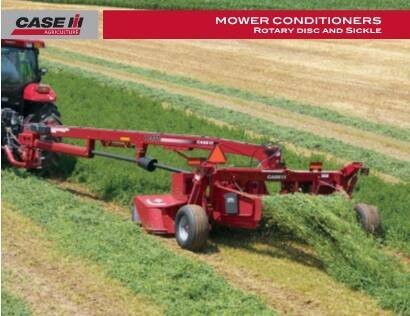 Hay and forage equipment from Case IH helps you put up the highest-quality hay. 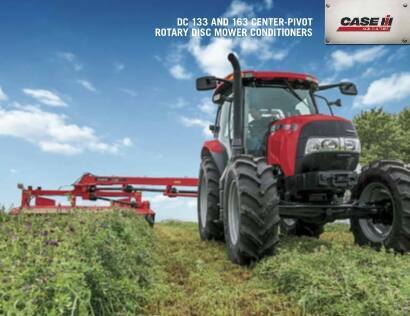 Learn about balers, disc mower conditioners, haying tips and more on the Case IH blog. Configure and price your new rotary disc mower conditioner. Customize it the way you want. Compare our rotary disc mower conditioner specs to other manufacturers' specs.